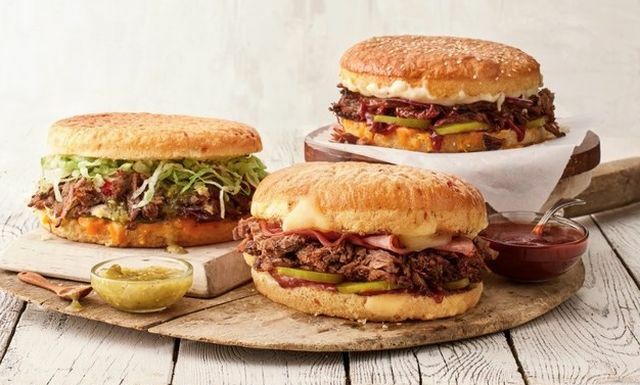 Schlotzsky's introduces a trio of new brisket sandwiches inspired by the chain's Austin, TX roots. - Traditional Brisket - Hickory-smoked brisket with mozzarella, cheddar, and Parmesan cheeses, barbecue sauce, sliced dill pickles, and red onions on a toasted sourdough bun. - Cuban Brisket - Hickory-smoked brisket with ham, Swiss cheese, barbecue sauce, Dijon mustard, and sliced dill pickles on a jalapeno cheese bun. - Tex-Mex Brisket - Hickory-smoked brisket with queso fresco, cheddar cheese, salsa verde, roasted red peppers, pickled jalapeños, lettuce, and chipotle mayonnaise on a jalapeño cheese bun. The sandwiches can be found at Schlotzsky's locations nationwide for a limited time.